both baroque and modern. Below, you find some information on some of the ensembles Anna plays and records with. 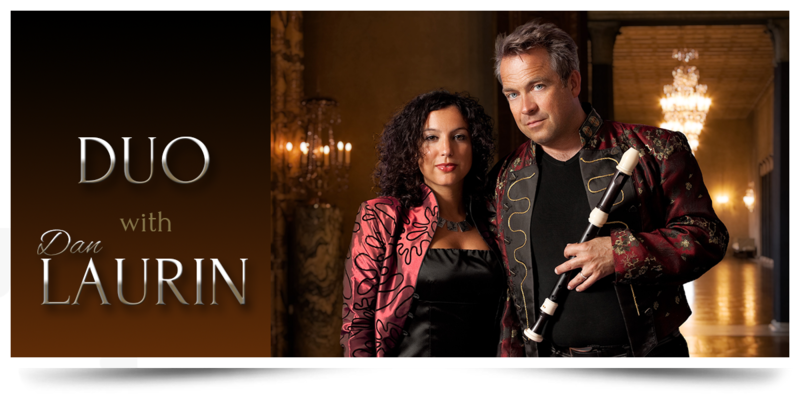 Dan Laurin recorders, Anna Paradiso harpsichord and piano. In 2008 Anna began to play with her husband, Swedish recorder virtuoso Dan Laurin, with concerts in the USA, Japan, Taiwan, Sweden, Italy, UK, Germany, Finland, Slovenia, France and for the Swedish and the Japanese TV and recordings (so far seven) for the Swedish label BIS. Having the unique privilege of communal daily practice as a starting point, Dan and Anna are engaged in a wide range of styles and composers, from the early baroque era to the high-baroque, from 1900 British music to contemporary music written for the duo, both with harpsichord and piano (by composers such as Fredrik Österling, Vito Palumbo, Daniel Börtz, Ingvar Karkoff, Christopher Elg, and more). For baroque music especially, Dan and Anna believe that the study of original sources on performance-practice and basso continuo is fundamental. The rhetorical gestural expression is also very central, since baroque composers and theoreticians looked at the music as a language and at the composition as a speech, with all its rules and structures dictated by the classical rules of rhetorics (Aristoteles, Cicero, Quintilian) . As the sources tell us, music must move, delight and astonish. At the center of all these human passions stands the performer, with his freedom of creating and choosing in the making. The duo gives also lectures and work-shops in conservatories and in master-classes around the world on themes, such as: classical rhetoric and J.S. Bach, the ‘Affetti’ theory in early Italian baroque, baroque articulation, baroque improvisation, ‘what is baroque’, etc. Songs of Yesterday – an Arcadian Dream (1900 music for recorder and keyboards composed for British recorder player Carl Dolmetsch: Bowen, Berkley, Rubbra, Murrill, Leigh, Scott). 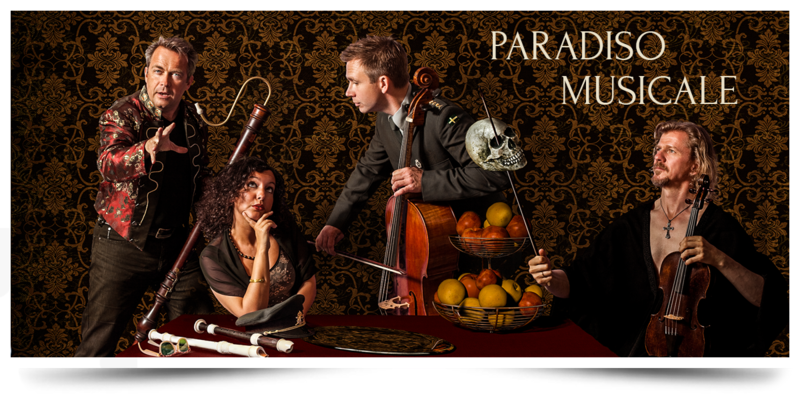 The original members of the baroque ensemble ‘Paradiso Musicale’ are: Dan Laurin, recorders, Henrik Frendin, baroque viola, Anna Paradiso, harpsichord, Mats Olofsson, baroque cello. Lutenist Jonas Nordberg joins them in several productions. The ensemble sometime hosts guests. The group first came together in 2007. Discovering a shared pleasure in fine wines and haute cuisine – and in not taking ourselves or each other too seriously – we formed what we like to think of as a luxury ensemble, working in a liberating environment, providing opportunities for experiments with unusual repertoire or playing techniques, and where a concert certainly is an occasion for reflection and emotions, but also for having fun for performer and audience alike. Paradiso Musicale’s combination of instruments is one for which there are very few original works. We are thereforefree to play the music that we like, whatever it may have been scored for. A rather Baroque approach, in point of fact. The ultimate goal is to achieve the feeling of a jam session when we perform. Consequently, our take on concepts such as authenticity and textual fidelity is less than dogmatic: in the end it all comes down to the creativity and critical thinking of the individual. C.P.E. Bach’s Trio Sonata for bass recorder, viola and basso continuo formed the centre piece when Paradiso Musicalemet with BIS’ recording producer Marion Schwebel in Länna Church, north of Stockholm. Around it the players have arranged pieces by C.P.E.’s father Johann Sebastian and his godfather, Georg Philipp Telemann into a varied and attractive programme which also illustrates the different professional and aesthetic strategies adopted by these composers. Paradiso Musicale botaniserar spontant och ohämmat i ”MUSIKALISKT TIDSFÖRDRIF”, denna unika tidskriftserie som klavérvirtuosen och förläggaren Olof Åhlström gav ut i Stockholm åren 1789-1834. Ensemblen plockar godsaker ur ett sällsamt musikaliskt ymnighetshorn som ger en fantastisk inblick i vilken musik som var på modet I Sverige runt sekelskiftet 1800. Åhlström gjorde en smått fantastisk klassresa som bondsonen från Södermanland som fotvandrade till Stockholm mitt under Gustav III:s statskupp för att så småningom etablera sig som en klart lysande stjärna i huvudstaden med nära kontakter i kretsen kring kungamördaren Anckarström… Vi får ta del av ett arv som den tidens viktigaste trend-spotter inom musikområdet lämnade efter sig 50 år efter att Johan Helmich Roman gått ur tiden. Några mästerverk av ”den svenska musikens fader” bildar en historisk, klingande relief. Romans barocka modernism hänför och väcker idag i allt högre utsträckning musikvärldens förtjusta nyfikenhet och beundran, inte minst tack vare ensemblemedlemmarnas många inspelningar av Romans musik, nu senast av den första, kompletta versionen av ”Golovinmusiken” från 1728, vilken redan slagit igenom stort i Sverige.